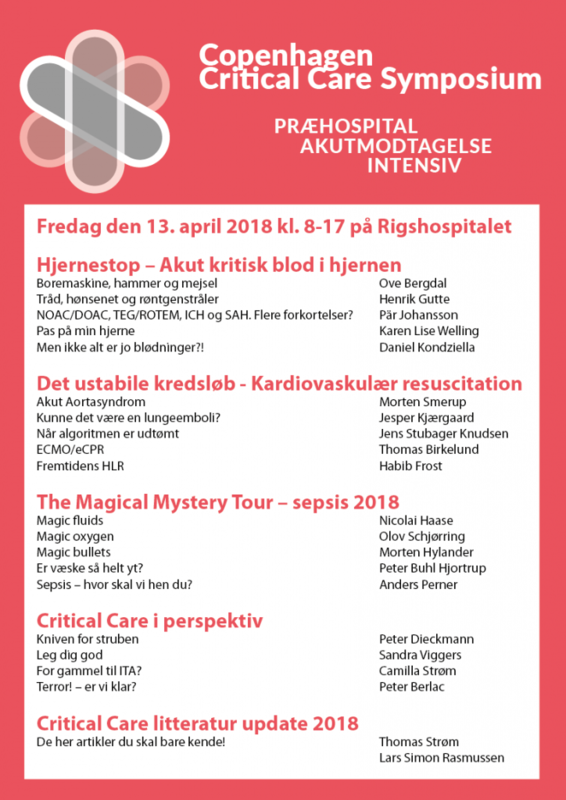 The first Copenhagen Critical Care Symposium was more succesful than we could have hoped for. It saw more than 120 delegates representing the full spectrum of tribes that come together in healthcare to help the critically ill patient convene for a day of talks with an interdisciplinary focus. The organizing team from Rigshospitalet and affiliated teams (FOAMmedic, SATS, ourselves from scanFOAM and more) had worked hard to deliver on their promise of a new and engaging format with most blocks of talks being motivated by a clinical conundrum introduced in simulation. In the spirit of FOAMed the talks were taped and (with a single exception) live streamed so you can judge for yourself. We are working on delivering the talks and slides in a searchable fashion, but till then feel free to revisit the livestreams below. The feeds have not been tidied up, so you’ll have to skip past breaks etc. The programme below may guide you.